When industries are in search of a company with a wide range of capabilities and technologies to provide them with engineering solutions, they look for a business that will grow with their ever-changing needs. Corporations from Cleveland, Ohio; Akron, Ohio; Pittsburgh, Pennsylvania, and beyond can find specialty tooling designs, custom cast urethanes, compression molded parts, and more at Seco Machine, an A. Stucki Company. 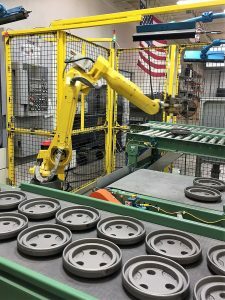 Seco Machine in Northeast Ohio, brings concepts to reality, from prototypes to large volume automated production, on state-of-the-art equipment. 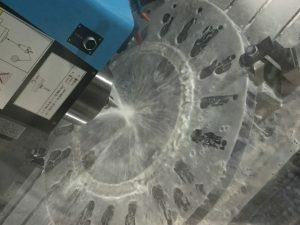 This local machine shop leads the industry in comprehensive contract manufacturing with machining being the heart of their passion — primarily turning and milling. They offer a broad array of ancillary services that include, but are not limited to, warehousing of raw and finished materials, light assembly, laser etching, and heat treatment. The considerable effort that they have dedicated to machining austempered ductile iron (ADI) has made them an industry leader in precision tool manufacturing. Seco Machine strives to engineer and manufacture quality and performance in every product. Seco Machine continues to go above and beyond to create the highest customer satisfaction with their continuous assessment and improvement of their product quality and processes. They are an AAR M-1003 compliant quality system, as well as ISO 9001:2008 certified, and have the range of equipment required for the precision necessary to produce tight-tolerance parts. These features make them one of the most comprehensive local machine shops from Pittsburgh to Cleveland. Seco Machine is regularly machining ADI (austempered ductile iron) to a hardness of approximately 50 Brinell, which is possible due to the development of their own specialty tooling designs and coolant formulas. Both small and large companies across all industries who excel at developing and marketing products can rely on Seco Machine to provide comprehensive contract manufacturing with the exact specifications. They boast an unmatched quality in precision tool manufacturing for industries that include automotive, railcar parts, waste water, oil and gas, construction, and transportation. Some of their precision-machined products include backing rings, axle end caps, plugs, bearing cones, and bushings. Not only do they ship between 1,500 to 2,000 orders each month, they offer a vast array of ancillary services, including warehousing raw and finished materials and assembly. As an extension of Seco Machine, Seco Urethane, in Northeast Ohio is a worldwide urethane molding manufacturer with automated high-production urethane pour capabilities that specializes in custom cast urethanes and compression molded parts. With in-house mold production that supplies their own low-pressure urethane line, there is no need to outsource a project. They combine the latest advances in polymers with expert engineering and high-tech specialty tooling design that follows products from prototype through to production with a combination of ovens and conveyor ovens. Seco Machine’s urethane is not rated hazardous and is offered in thicknesses from ½” to 2 ½” in orange, gray, clear and white, with a hardness range from 30A to 70D. 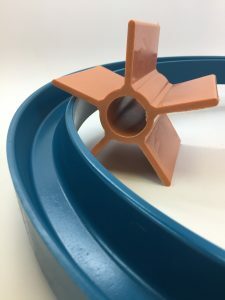 Businesses choose well when they choose urethane for their unique projects because of its physical properties, tensile strength, and superior abrasion. Whether a railroad division in Pittsburgh, Pennsylvania, is looking for specialty tooling designs with austempered ductile iron or an automotive parts company in Akron, Ohio, requires the warehousing of raw and finished materials, Seco Machine offers comprehensive contract manufacturing. From precision machining, like tool manufacturing, for Cleveland, Ohio, to mold making capabilities for custom cast urethanes and compression molded parts for Northeast Ohio, this local machine shop has been offering superior customer service for over 30 years, putting them at the top of each industry that commissions them to provide solutions. Calling Seco Machine will be the best decision that anyone can make to drive their business beyond what they ever thought possible. This entry was posted in Business to Business, Custom Cast Urethanes, Equipment Parts, Laser Marking/Engraving, Manufacturing & Repair, Material Handling, Precision Tools and tagged A Stucki Company, austempered ductile iron Akron Cleveland Northeast Ohio Pittsburgh Pennsylvania, compression molded parts Akron Cleveland Northeast Ohio Pittsburgh Pennsylvania, custom cast urethanes Akron Cleveland Northeast Ohio Pittsburgh Pennsylvania, precision tool manufacturing Akron Cleveland Northeast Ohio Pittsburgh Pennsylvania, Seco Machine, Seco Urethane, specialty tooling designs Akron Cleveland Northeast Ohio Pittsburgh Pennsylvania, warehousing of finished materials Akron Cleveland Northeast Ohio Pittsburgh Pennsylvania, warehousing of raw material Akron Cleveland Northeast Ohio Pittsburgh Pennsylvania by admin. Bookmark the permalink.